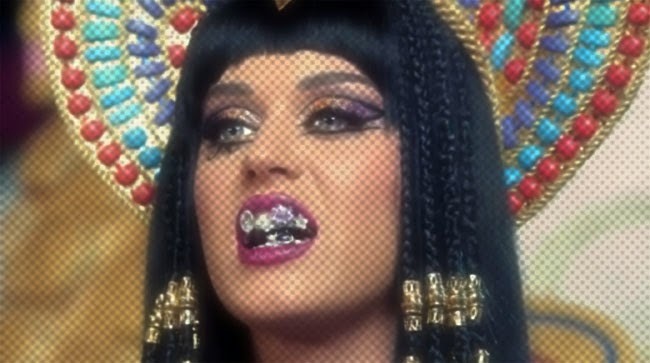 Yep, I'm late with posting the Dark Horse video by Katy Perry. But since everyone seems to be mightily offended by it, I figured I may as well so you guys can comment on it. My two pennies on it are thus: it's a cute video that makes no sense what.so.ever. There's no connections to ancient Egypt in the lyrics- though the ancient world is referenced with mention of Aphrodite- yet the video is rocking the theme as if its life depended on it. Also, the visuals are oddly light and bright, despite the Diva referring to the song as "witchy and dark", and the rap segment mentioning a serial killer, cannibalism and steroids. But I think that was the point. The video's frothy aesthetic was chosen to make the song more palatable to middle America. After all, that is where the bucks are! Ignoring the motives behind the video, simply put: I liked it. It was a fun take on a period of history that I've always been fascinated by. But I'm not a Muslim, nor someone connected with Egypt in any way, so perhaps it's unsurprising I took it as nothing more than a pop video. But what do you guys think? Is it offensive or just a bit of fun? [Read more at Time Magazine Online].